I haven’t written about the prompts of depth and complexity in a while, but they’re an incredible tool to begin differentiating learning objectives. Teachers can quickly modify a lesson’s goal to increase the challenge by plugging in the depth and complexity prompts. But, I frequently see the prompts used at a mere surface level in classrooms. Note, however, that the thinking skill is unchanged. 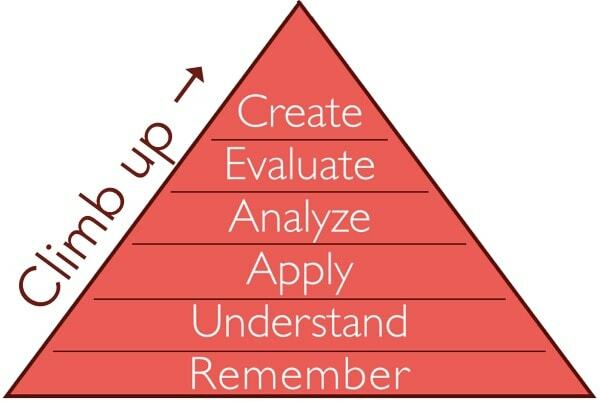 Students are still “looking for.” On Bloom’s Taxonomy, that’s “identify” — a very low-order thinking skill. 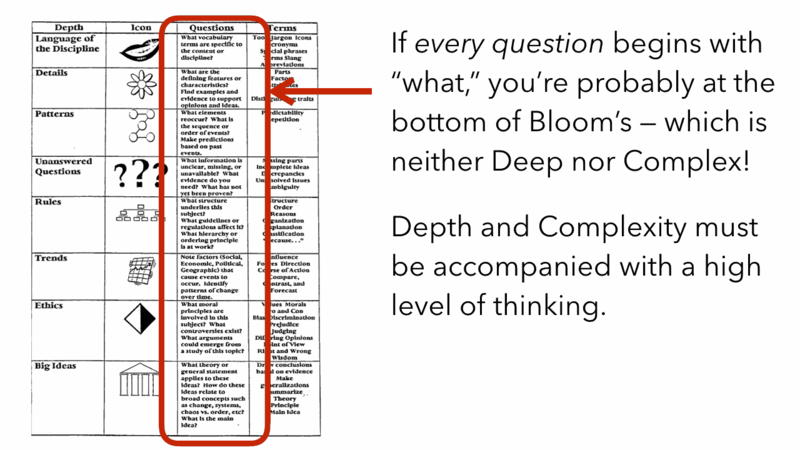 When we use depth and complexity we can’t neglect the thinking skill. When planning a lesson, we have to not just differentiate content (which is what the prompts of depth and complexity do), but also adjust the thinking we expect students to do. List the main characters’ names in Romeo and Juliet. Here, despite the seemingly low level of initial content (Dr. Seuss), we’ve pumped up both the content (by making it about the ethical use of power) and the thinking (evaluate; compare and contrast) so that it’s actually a pretty interesting question even for older students. When writing an objective, we must increase the complexity of not just the content, but also the thinking skill. Look for patterns in a character’s actions. Compare the patterns in this character’s actions with another character’s. Judge the ethics of the patterns we see in this character’s actions. Create a new situation that would continue this pattern. And notice how each step easily leads to a larger, more complex product. At level one, a student could just write a sentence, but after that, the responses need to be bigger. Perhaps by the end, students are debating and creating skits. Many years ago, I created The Differentiator, an interactive tool based on these ideas to help you modify the parts of a differentiated objective. Play around with it to see what a big difference the thinking skill can make!